A Standard 10 Companion from 1961-1962. Homepage. This page: A late example of the Standard Companion estate car, which for a change is a runner and road-legal. The idea of a classic estate car had been bouncing around in my head for a while, so when the chance to buy this rare Standard Ten Companion came along, it was too good a chance to miss .. I think. Browsing a certain auction site late one evening can be a risky pastime, especially if perusing the old-motors section. Somehow I found myself browsing one of the sections on there, when this little Standard 10 Companion scrolled into view. I've been a fan of Standard 10s for some time now, and think they're definitely under-rated cars. The last one I'd had, a 1957 Standard Super Ten, went to a new home in 2003, and I'd been amazed ever since how cheap even nice examples seemed to be. The idea of owning a Companion, or maybe the super-rare van version, had always been in the back of my mind, but the chances of finding something half-decent seemed remote. So when this appeared on the screen, in all its lovely brownly-ness, it needed to be looked into. The auction had been running for a couple of days or so, yet not many people had looked at it - perhaps because it wasn't in the usual Classic Cars section. Worryingly, it had a Buy-It-Now price, which meant that ownership was but a few clickety-clicks away. The description, whilst fairly brief, did suggest that it was a presentable car, in roadworthy condition. I tried telephoning the seller but there was no reply. I showed it to erindoors, to gauge her opinion before moving my mouse over the B-I-N button. She agreed that it looked quite tidy, and was probably more impressed by the fact that, for once, I was looking at something road-legal for a change, rather than something waist-high in nettles, or buried away in true barn-find condition. With her ringing endorsement (well, outline approval-ish) still ringing in my ears, the wise thing to do was to click the button, before someone else was overcome with a desire to be this Companion's new owner. Ideally I'd have gone to look at it first, or at least spoken to the owner, but sometimes hesitation can be a very bad thing - snooze, you loose, and all that. Plus I'd be paying cash on collection anyway, so the risks were minimal. A day or two later I made contact with the seller, and he told me some of the Standard's story. He'd recently bought it with a view to using it on a drive to Ireland, as part of a classic car rally, taking the place of the '30s Vauxhall he normally would use. The car had been checked over, with various parts replaced, in preparation for the trip. However, the day before the "off", one of the rear wheel cylinders was found to be leaking, so in the end the Companion stayed on these shores. The cylinders were replaced, and the car put back in store at his firm's premises near Gloucester. Shortly afterwards he decided to put it up for auction. The following Saturday we climbed into the 'modern', and headed southwards to collect this neat little estate. The car was parked outside the unit, and it did look quite presentable, albeit with a few blemishes here and there as I'd expected. Being a 1962 model it shares the revised front wings of the Standard Pennant, rather than the earlier 8s and 10s, and I do prefer the earlier style. A quick test drive suggested that mechanically all was in order, so the deal was done and the readies handed over. By now the weather had worsened, and dark cloud and drizzle had descended upon the scene. If nothing else, the miserable weather would be a good test of the car and its systems. The journey covered approximately 110 miles, the car arriving home safely and in one piece. The only downside to the trip was a foul-mouthed tirade from two thick chumps in a modern 4x4 pickup, who insisted on overtaking at the earliest possible opportunity. I wasn't exactly dawdling along, indicating 45-50mph for the most part, but this evidently was way too slow for the muppets in the 4x4. With the Standard safely tucked away in the garage, it was time to check it over. Despite being readied for a trip to Ireland, there were a few things they'd overlooked. The fan belt was on its last legs, and the oil looked decidedly gloopy. A fresh drink of 20/50, including a new filter, followed by an intensive session with the grease gun, soon had the lubrication side sorted. It had been fitted with a modern high-level brake light. Although on the one hand a good idea, its position meant that it was directly in my eye line when looking at the rear-view mirror, so that was removed. I'd been told that the rear seat was in a very poor condition (it was folded down, under a piece of carpet when we collected it). However the back seat was nothing of the sort, and is in fine condition. The front seats are a little dowdy, but for a regular-user will do the job just fine. 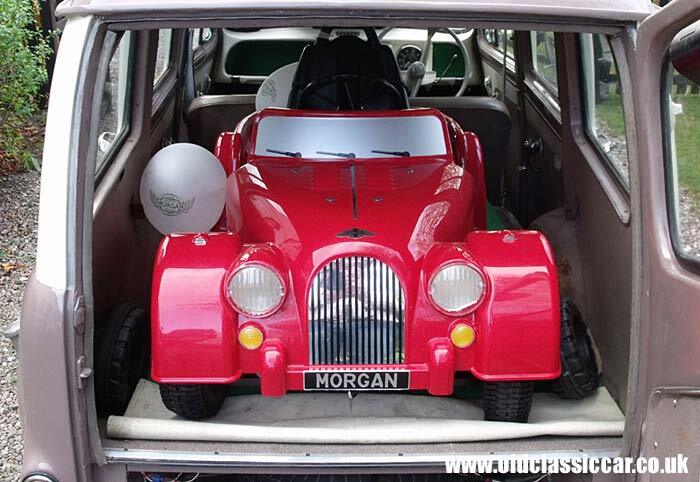 The following day, the Standard was pressed into service with a run over to my folks' place, to collect a Morgan pedal car. A few days before Dad had been on a visit to the factory at Malvern, and he saw this pedal car for sale. Thinking it'd be just perfect for our little ankle-biter, he snapped it up. It could have been made-to-measure, so snugly did it fit in the back of the Standard. I kept the Companion until 2011. The Standard 10 was introduced in 1954, joining the 8 that had been launched the previous year. 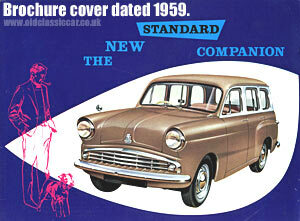 The Companion, estate-car, version landed in the Standard dealerships in 1955. These cars differed in a number of detail ways when compared to my example. As well as being fitted with the 10's curvier front wings, these early Companions also had two rear doors, whereas mine has a side-hinged, one-piece door. Unusually for a small estate, it didn't share its main body pressings with the contemporary small vans in the range. Both the Standard 10 Companion and the 7cwt Van had their own bodyshells, which must have led to high tooling costs. The van was a two door, and the saloons were all four doors. The Companion also had four passenger doors, the rear door being unique to this model. 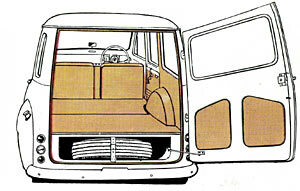 Most rivals of the time, such as the A30 and A35 Countryman, shared their key body pressings with the van version, with extra glazing let into the body sides and rear seats installed. The Standard though was an estate through-and-through. The Companion outlived the saloon by some years. In 1957 the Pennant saloon was introduced, featuring the peaked wings front and rear. It remained in production until 1960, by which time Standard-Triumph's Herald was rolling out of the Canley factory. The Companion continued in production for a little while longer, until such time as the Herald estate was ready (which did share its body with the Courier van). 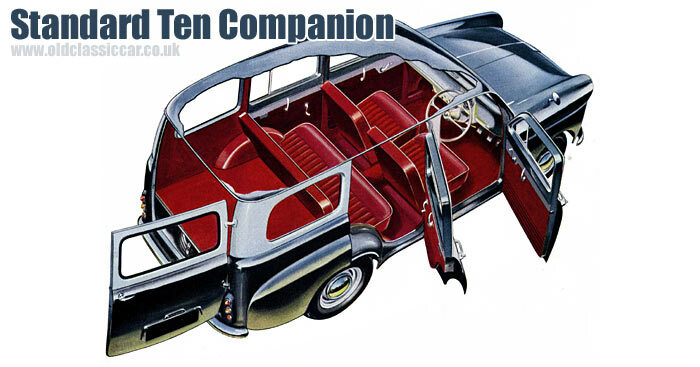 Production of the Companion lasted until 1961. Mine was registered in March 1962, so presumably sat in a dealership for a while until finding a buyer. I don't have any of its history, so if anyone can fill in the gaps in 146 ARX's past that'd be great. It was first registered somewhere in Berkshire. The running gear will be familiar to many Triumph owners. The engine started out as an 803cc unit in the original Standard 8 of 1953. For the 10 it grew to 948cc, mirroring the evolution in displacement of BMC's A Series engine of the time. The Pennant and Companion estate continued with the 948cc engine, passing it over to the Herald of 1959. In later years it would be stretched to 1147cc (Herald 1200, Spitfire 4), then 1296cc (Herald 13/60, Spitfire Mk3). The engine was then stretched to 1493cc for the final Spitfires and MG Midgets. The Companion would carry upto 5cwt in its rear load area (plus driver and passenger), and measures 12ft 0in in length. When new it came with 5.60-13 crossply tyres. Colours for 1959 were as follows: Phantom Grey, Powder Blue, Cotswold Blue, Nimbus White, Lichfield Green, Coffee, Pale Yellow, and Black, all with white window surrouds to give a two-tone look. Earlier Companions tended to be single-tone.